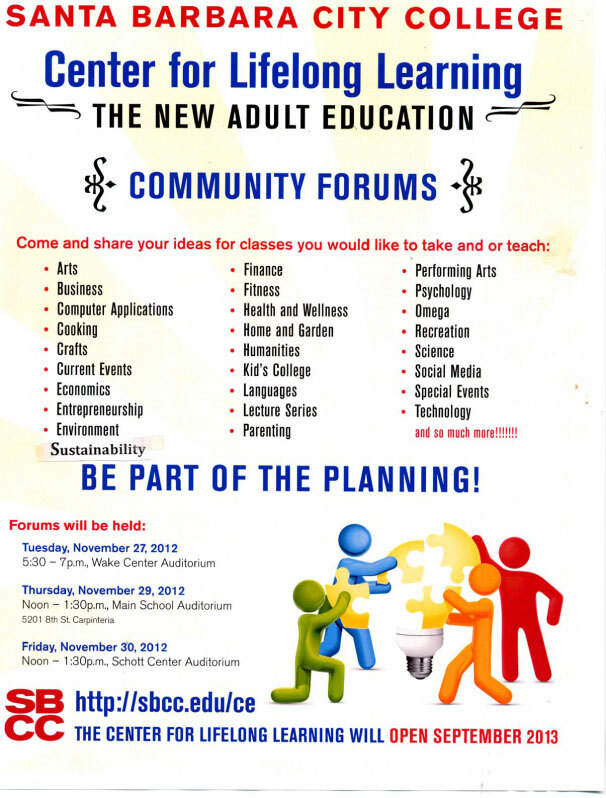 PLEASE attend and give input for the Center for Lifelong Learning (CLL). We need input from the Environmental and Sustainability communities with ideas for curriculum. After over a year of analysis and development, Santa Barbara City College announces it will launch the new Center for Lifelong Learning (CLL) in September 2013. The center will offer the community non-credit, self-supporting classes and seminars primarily in the personal enrichment and advancement areas. Classes will meet at SBCCs Wake Center and Schott Center in Santa Barbara and other locations throughout the area. SBCC will offer three community forums in November to share the vision and progress of the CLL and seek input on the types of course offerings that the community wants and will support. "Reduction in state funding presented our Continuing Education Division with a huge challenge but the center is a viable and exciting option," said Dr. Jack Friedlander, SBCC Executive Vice President. "We really want to thank the community members who served on our earlier advisory committees and gave us such thoughtful feedback." Because of its community service structure, the CLL will have greater flexibility to offer self-supporting courses in a variety of formats and time frames that can be more fluid and responsive to the learning needs and interests of the community. SBCC and the community have long taken great pride in the breadth and quality of our Continuing Education offerings, said Dr. Friedlander. With the Center for Lifelong Learning, we have the opportunity again to build an outstanding program that meets the learning needs and interests of our community. I invite everyone to attend one of the forums and give us feedback on what types of courses and programs they will support through the CLL. Amazing long term history of Environmental & Sustainability programs in Continuing Education/adult Ed starting in 1989. By 1994, the programs began to reflect Santa Barbara's interest in Sustainability. LIst of all the community groups, local government, colleges,University and businesses that cosponsored programs for Environment,Sustainability and Science are listed at the bottom of email. 1. What is the Center for Lifelong Learning? The Center for Lifelong Learning (CLL) is the successor to SBCC's fee-based program at Continuing Education (Adult Ed). It provides a new approach that allows SBCC to deliver self-supporting and affordable fee-based courses. The CLL will offer the Adult Ed classes people have enjoyed for years along with exciting new additions. 2. Why is the CLL being established? The main reason is due to the cuts in state funding for the college. SBCC will not continue to offer as state-funded many of the classes it has historically provided without fee. The CLL will be the venue through which the college will continue to offer current classes appropriate for conversion to fee-based. While the loss of funding to CE is dismaying, there are benefits to having classes free from the constraints of state regulation. The ability to offer a broader range of classes, workshops, conferences, trips and tours, is much greater without the restrictions of the Chancellor's Office. 3. How can the CLL expand its curriculum and course formats? Without state funding for CLL classes, the same rules don't apply. Changes such as different class lengths (2 day, 5 weeks), formats (lecture series, travel sessions) and subjects (brain science, climate change, Chinese glazes) are now possible. Classes are projected to be in full swing in the Fall of 2013. 5. Who is helping to build the CLL? The CLL Transitional Workgroup, community volunteers, meets weekly to lay the groundwork for this program. They meet frequently with Dr. Jack Friedlander, SBCC Executive Vice President, to work on the curriculum, financial models and marketing for the Center. The group will meet regularly with the Executive Director to provide community guidance. 6. Will the classes be affordable? The CLL will have to charge a fee as it needs to be self-supporting. However, every effort is being made to keep costs down - scholarships and sponsorships are anticipated. 7. Is the CLL part of SBCC? While the CLL will be placed in SBCC's Educational Programs division, it will have its own Executive Director and function with input from a volunteer community consultation council. 8. Can I participate in the planning of this new program? Yes, provide us with your e-mail address and we will keep you updated on what is happening as well as send you information on a variety of ways you too can participate. 9. Will I be able to register on-line and what if I don't have a computer? There will be on-line as well as in-office registration at the Schott and Wake Centers. 10. How do I find out more about the CLL? Contact the Wake (Andy Harper, agharper@sbcc.edu) and Schott (Kendall Harris, KEHarris1@sbcc.edu) Centers for more information. Sustainability is not just science or environmentalism, but is truly a category unto itself. A quote I like to use, but not the only distinction, comes from one of our past presenters for the SBCC Center for Sustainability. Sustainability is often confused with environmentalism. Though related, environmentalism is the concept that the restoration and preservation of nature is of utmost importance, above all other considerations, whereas sustainability means adopting a self-perpetuating, cyclical, closed-loop approach to production and consumption. "To prepare for the future, we can love the present"
The future is abundant, asserts permaculture designer Larry Santoyo. His vision of living in the present suggests an antidote to fear about uncertain times and the future. Humans can rediscover that they are a part of the ecosystem, and apply permaculture design principles to the many problems we face. 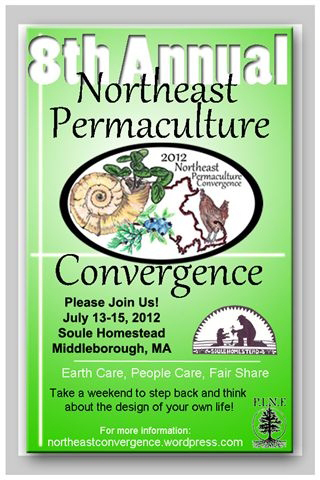 Larry teaches sustainable permaculture design as a discovery of the world around us. Santoyo credits his early training as a police officer for giving him some of his most profound human insights. Trained to respond to stressful situations with calm, clear thinking, and keen observation skills while staying centered in the present, he was able to help those in distress while keeping them and himself out danger. In our eco-anxiety ridden times many are also in distress with stressors that threaten to endanger and paralyze us. But Santoyo suggests that we needn't let these fears shape us, but instead, by choosing what we love about the present, and developing useful skills to benefit ourselves and others, we have a solid foundation upon which to build the future. Larry Santoyo is the Director of EarthFlow Design Works (http://www.earthflow.com), a community planning and design firm that integrates economic development strategies with ecological systems management. Born in East LA, Santoyo has been teaching Permaculture since the1980's both nationally and internationally, most recently returning to Los Angeles, where he teaches Urban Permaculture to a large and receptive audience. Permaculture for Humanity is his forthcoming book. No reservations required and parking is free on Sundays. No reservations required & parking is free on Sundays. What Makes a Great Food City? With more than 50% of the worlds population now living in cities, sustainability & good ecological design for resilient local food systems has never been more important. In the 21st Century, with innovative policy and design strategies, there is an opportunity to re-invite food and food growing back into our cities, while solving some of the planets most pressing environmental problems. 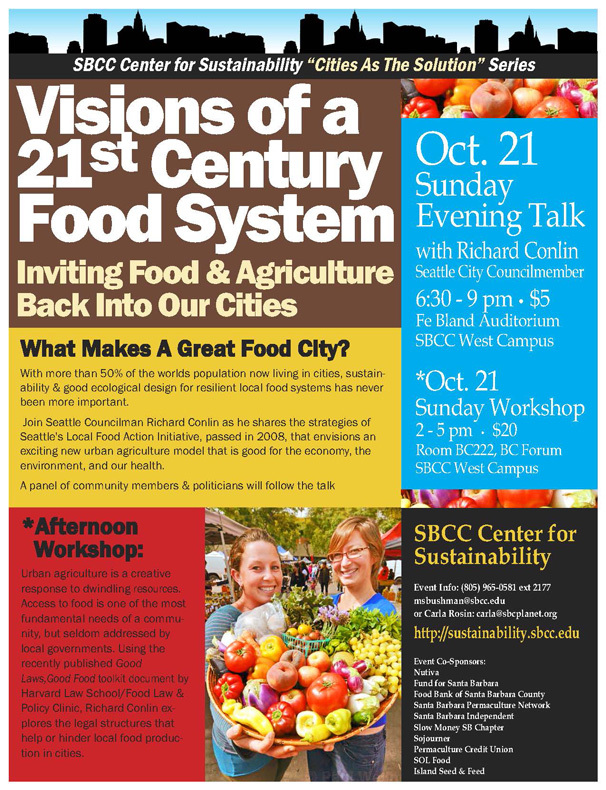 Join Seattle City Councilmember Richard Conlin as he shares the strategies of Seattle's Local Food Action Initiative, passed in 2008, that envisions an exciting new urban agriculture model that is good for the economy, the environment, and our health. Urban agriculture is a creative response to dwindling resources. Access to food is one of the most fundamental needs of a community, but is seldom addressed by local governments. Using the recently published Good Laws, Good Food document by Harvard Law School/Food Law & Policy Clinic, Richard Conlin explores the legal structures that help or hinder local food production in cities. Also shared will be examples of state and local Food Policy Councils around the country with diverse stakeholders that have come together to forge a response aimed at strengthening local & regional food systems. Richard Conlin was first elected to the Seattle City Council in 1997 after many years of public service with Seattle-based community organizations. In 2008 he launched the Local Food Action Initiative to increase Seattle's access to nutritional foods and strengthen the security of its food supply. 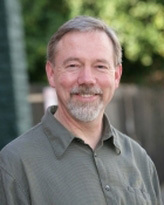 Conlin co-founded Sustainable Seattle in 1991 and is the founding publisher of YES! magazine. He currently serves on the Board of YES!, the Antioch University Seattle Board of Trustees, and the Board of Directors of the National League of Cities. Conlin holds a B.A. in History and a Master's degree in Political Science. Nutiva, Fund for Santa Barbara, Santa Barbara Permaculture Network, Santa Barbara Independent, Slow Money SB Chapter, Sojourner, Permaculture Credit Union, SOL Food, & Island Seed & Feed. recently published document by the Harvard Law School/Food Law & Policy Clinic. 40 years as a community food activist, writer, and trainer. As the food and financial crises bring fresh urgency to concerns over hunger, food access, public health, labor and economic development ­ citizens and governments are beginning to connect these issues back to the food system as a whole. Councils are springing up across North America to "connect the dots"1 between the growing number of neighborhood food initiatives and communities forging policies for just, healthy food systems. Gerry Brown has passed AB 1616, that states under "specified requirements related to training, sanitation, preparation, labeling, and permissive types of sale"; the production and sale of "non potentially hazardous foods" is permitted from non certified/commercial kitchens. Sounds pretty awesome, yet sorta hard to regulate & enforce. Seems like a great opportunity for many. The Local Food Action Initiative establishes goals, creates a policy framework, and identifies specific actions to strengthen Seattle and the region's food system in a sustainable and secure way. A RESOLUTION establishing goals, creating a policy framework, and identifying planning, analysis and actions for the purpose of strengthening Seattle's food system sustainability and security. Local food systems were recognized as an important component of the City of Seattle's leadership on sustainability when City Council adopted Resolution 31019 on April 28, 2008. The resolution includes the goal of creating a policy framework to strengthen Seattle's food system sustainability and security. The resolution also lays out a series of steps to reduce hunger and encourage the production and consumption of more locally grown food. The resolution specifically tasked City departments to assess their respective policies and planning processes to ensure support for food system planning. was established in September 2010 at the Puget Sound Regional Council (Seattle Region) to bring together community, government, business and agricultural interests to work on integrated and sustainable policy recommendations to strengthen the regional food system. California Financial Opportunities Roundtable (CalFOR) released their new guidebook to provide a resource for entrepreneurs and small business owners seeking capital. CalFOR is comprised of a group of nearly 90 experts and activists, including CEC's Jenny Kassan and Elizabeth Ü, representing large banks, small financial institutions, wealth advisors, fund managers, the business community, and economic development organizations as well as local, state, and federal government agencies. 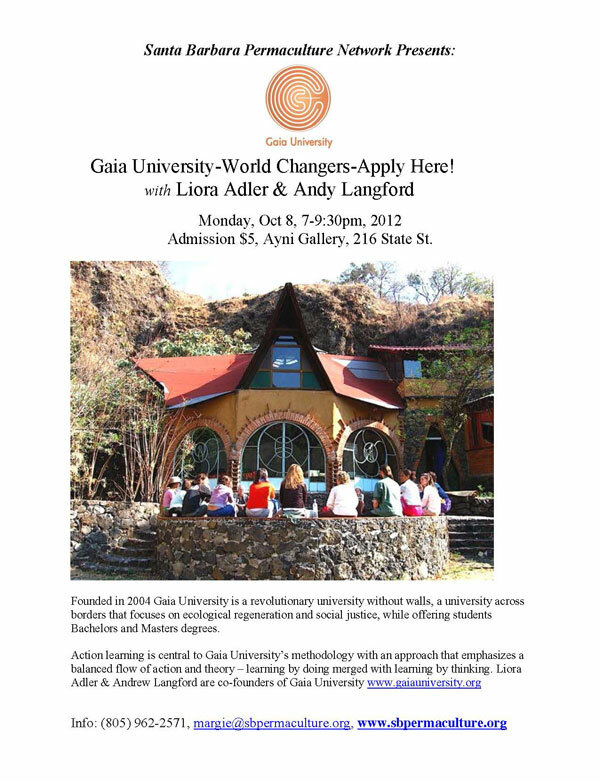 Join Liora Adler & Andrew Langford on Monday, Oct 8, 7-9:30pm, with a talk about Gaia University and action based learning. Founded in 2004 Gaia University is a revolutionary university without walls, a university across borders, that focuses on ecological regeneration and social justice while offering students Bachelors and Masters degrees. Action learning is central to Gaia University methodology with an approach that emphasizes a balanced flow of action and theory – learning by doing merged with learning by thinking. Gaia University offers a unique and flexible model based on self-directed, project-based pathways. With a minimum of required courses, students devote the major part of their energy towards the design, implementation and documentation of real-world projects, with a support web of advisers and mentors who assist in the practical development of projects and encourage students to develop the capacity to think critically about their work and inner processes. Liora Adler & Andrew Langford are the co-founders and co-presidents of Gaia University. Liora has over thirty years experience with ecovillages and the establishment of global networks. In 1982 Liora co-founded Huehuecoyotl Ecovillage in highlands of Central Mexico. Liora was lead partner of the spectacular Caravan Arcoiris de la Paz theatre that toured South America from 1996- 2009 carrying messages of peace and permaculture. Liora has served on the Board of the Global Ecovillage Network, as a UN representative, and is a Board Member of The Global Village Institute. She holds an Master of Education with a major in counseling psychology. Andrew holds a Masters degree in Organization Analysis and Development and a postgraduate Diploma in Management Studies but believes his most potent education takes place outside of conventional institutions. Andrew initiated permaculture teaching in the UK starting in 1985 and, together with others in the Permaculture Association of Britain, helped train more than 3,000 permaculture designers. He is a principal architect of the Permaculture Diploma WorkNet from the UK. Gaia University charts a pathway to accreditation though IMCA (International Management Centers Association) and Revans University–the only action-learning university in the world. 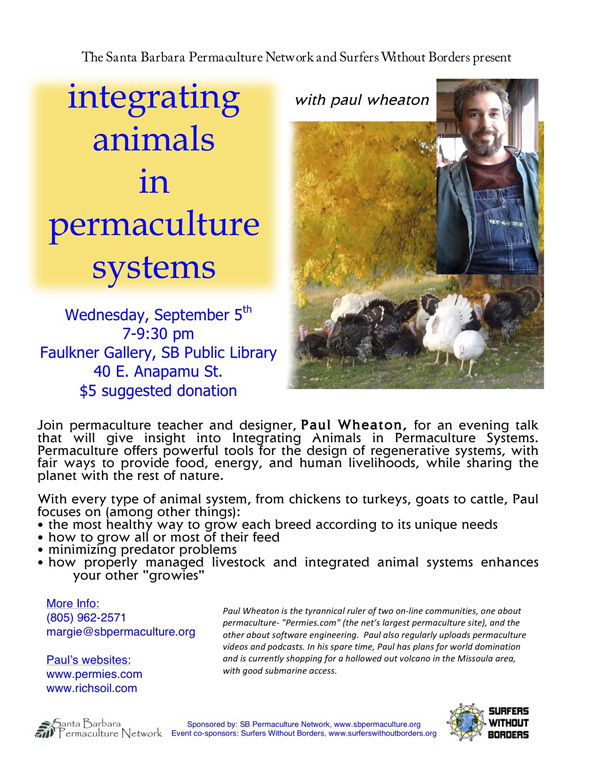 Please join us for an evening with the colorful and dynamic permaculture icon Paul Wheaton as he talks about one of his favorite subjects, Integrating Animals in Permaculture Systems, on Wednesday, September 5, 7-9:30 pm. Permaculture offers powerful tools for the design of regenerative systems, with fair ways to provide food, energy, and human livelihoods, while sharing the planet with the rest of nature. In Permaculture design, animals are considered a critical component of any sustainable system. :: how properly managed livestock and integrated animal systems enhance your backyard gardens and small farms, or integrated systems of agriculture. Paul Wheaton is a software engineer turned permaculture enthusiast, who in his own words, is currently "the tyrannical ruler" of two on-line communities, one about software engineering, and the other, Permies.com, now the largest permaculture website forum on the internet. Paul regularly uploads permaculture articles, videos & podcasts to promote and share his permaculture passion to the largest audience possible. As a certified master gardener and a certified permaculture designer, Paul Wheaton gardens, farms and lives what he preaches in Missoula, Montana. Article on Chickens-raising -chickens 2.0: no more coop and run! 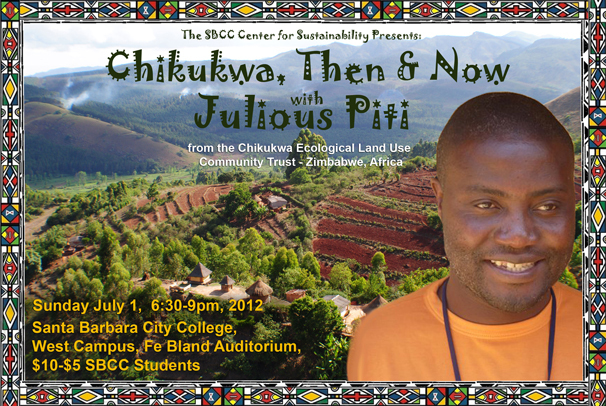 Please join the Santa Barbara City College Center for Sustainability on Sunday, July 1, as we host Julious Piti, founding member of the Chikukwa Ecological Land Use Community Trust (CELUCT) in Zimbabwe, whose ecological design work in Tanzania has recently been featured in the award winning film From the Mara Soil. In the communal lands of Chimanimani on the borders of Zimbabwe and Mozambique---in the midst of civil wars, deforestation, drought, and severe land degradation---a wonderful story has been unfolding for the last twenty years, an example to the world. Where once the people of the Chikukwa villages in this region suffered hunger, malnutrition and high rates of disease, communities have transformed themselves with permaculture land strategies and farming techniques, and along the way have become masters of conflict resolution. Julious Piti experienced the violence of war first hand as a teenager fleeing Mozambique to Zimbabwe during times of conflict. These experiences led him with other Chikukwa community members to a lifetime of work committed to healing both the land and the people. Many projects flourished through the years at Chikukwa, but the success of these projects also led to difficulties. Conflict and suspicion arose around many issues within the community, but when examined carefully, it was found most were based on communication breakdowns. From these difficulties, the creation of an extraordinary handbook called The Three Circles of Knowledge; How to Build Constructive Community Relations by Understanding Conflicts in Rural African Communities occurred. The approach of the book is based on the three circles method, which aims to work with the areas where indigenous, spiritual and analytical knowledge overlap. This method was developed by a core Chikukwa community group and utilized deep indigenous understanding. There is much for the world to learn from Chikukwa and CELUCT, for not only have they managed to stay food secure and peaceful during the conflict ridden years of Zimbabwe, but they have done this with solutions that came from within the community, not imposed from the outside, and with very little help or funding from international aid agencies or NGOs. Some 20 years ago, most were trying to survive on cash crops that caused deforestation and erosion, now over 80% of the population of the Chikukwa villages practice permaculture, growing food for themselves with a surplus to share, on lush and abundant mountainsides where springs honored by indigenous beliefs, have once again sprung to life. Julious Piti is a permaculture teacher, designer and trainer, and conflict facilitator. He is a founding member of the Chikukwa Ecological Land Trust (CELUCT) and the Director of PORET, an organization formed to support farmers in the low rainfall area of Chaseyama, Zimbabwe where he now lives, by replicating the strategies of CELUCT. In 2009 Julious was hired by Global Resource Alliance, an NGO based in Ojai CA, to facilitate a permaculture design project for a village of 5000 on the shores of Lake Victoria, Tanzania, featured in the film, From the Mara Soil. Film producer Gillian Leahy and Terry Leahy, author of Permaculture Strategy for the South African Villages (University of Newcastle, Australia), are currently making a documentary film about Chikukwa. A presenter at the International Permaculture Convergences in Brazil, Africa, and Jordan, Julious Piti has been invited to teach at the upcoming Permaculture Design Course for International Development & Social Entrepreneurship at Quail Springs Learning Oasis and Permaculture Farm in California, July 2012.
one of five films selected by a partnership between the Sundance Institute and Hilton Worldwide to receive the 2012 Hilton Worldwide LightStay Sustainability Fund & Award. The Chikukwa Project - Some Scenes from Gillian Leahy on Vimeo. The Chikukwa Project - Trailer from Gillian Leahy on Vimeo. Global Resource Alliance invites you to a free community event to celebrate their 10th Anniversary. There will be a complimentary gourmet vegan dinner, strawberry shortcake for dessert and a presentation on sustainable development and permaculture projects in Tanzania by GRA directors and guest speaker Julious Piti from Zimbabwe. Please RSVP by emailing globalresourcealliance@gmail.com or calling Monica at (805) 272-5645. Come hear the story of how an ecological initiative in started a small village in the Eastern Highlands of Zimbabwe and grew into a community model of sustainable living. Along the way they have become masters of conflict resolution. The project has been about health, conflict resolution, and social improvement­as well as food. Co-Presented by OAEC's Permaculture Program, Daily Acts and the Sebastopol Grange . $5-$10 sliding scale donation requested. All proceeds (minus nominal Hall fee) will go directly to support the efforts of CELUCT. and also Jeremiah Kidd jeremiah@sipermaculture.com. "Money is like an iron ring we've put through our noses. We've forgotten that we designed it, and it is now leading us around"
A ccording to Bernard Lietaer, scarcity doesn't need to be a guiding principle of our economic system. He also suggests that money should work for us, not the other way around, and unlike the weather, wasn't created by Nature, it was created by us! Monetary systems have existed throughout human history, and with the centuries-old model that currently exists, has been the culprit for many of the negative economic and environmental issues we face today. But what most have forgotten is that money is a human designed construct that we absolutely have the ability to re-design for a more abundant and sustainable future. Join the SBCC Center for Sustainability for a talk with Bernard Lietaer, author of the newly published book, "New Money for a New World" on Sunday, May 6, 6:30-9pm, as he discusses radical but proven ideas about complementary currencies and their ability to strengthen local communities and their economies, while buffering them from the ups and downs of the global economy. Using innovative new systems of exchange, along side existing national currencies, Lietaer suggests we move away from single currency monocultures, with their inevitable boom and bust cycles, to multiple and diverse systems of exchange. When one exchange system goes down, another one is in place for welcome stability, with a resilience and diversity that mimics natural ecosystems. Sharing compelling examples of successful complementary currencies used around the globe today and those from past eras of history, Lietaer's ideas are less revolutionary than they appear. Using creative initiatives such as airline frequent flyer miles (a form of complementary currency promoting customer-loyalty in exchange for free travel), Time Banks, commercial barter, carbon currency and mutual credit systems, communities can empower themselves and flourish in spite of the current economic crisis, by simply rethinking how money works. For learning institutions such as colleges that currently leave many students in enormous debt and others left out of the system altogether, an exemplary complementary currency model is the Brazilian Saber, where funds from a small tax on cell phone usage is used to create "sabers" officially redeemable for teaching other students or tuition payments, thereby creating a "learning chain and learning multiplier" effect. The University of Missouri, Kansas City, introduced an innovative complementary currency called Buckaroos, that students can earn while performing community service activities. 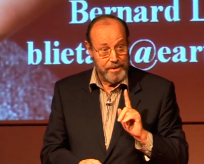 Bernard Lietaer is a former Belgium banker and the author of several highly acclaimed books including The Future of Money: Beyond Greed & Scarcity; and Creating Wealth; Growing Local Economies with Local Currencies, and his most recent, New Money for a New World. He has been active in the realm of money systems in a wide variety of functions for almost 40 years, including being one of the principle architects of the European euro. Formerly a professor of international finance at the University of Louvain, Lietaer was a fellow at the Center for Sustainable Resources at the University of California, Berkeley. Lietaer co-founded one of the largest and most successful currency management firms, GaiaCorp. He is co-founder of ACCESS Foundation, an educational non-profit organization whose goal is the re-alignment of sustainability and global financial interests. Business Week magazine named him "the world's top currency trader" in 1992. 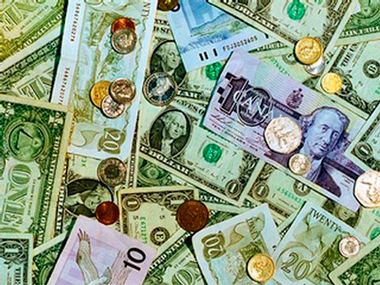 Faye Cox, local currency expert, will introduce and facilitate the talk, which will include an interesting discussion of how complementary currencies might be used to address critical social and economic issues in our region. The online forum for disseminating knowledge about community and complementary currencies around the world. "National currency is cold and selfish by itself. So let's create community currencies with which we can warm up our communities as New Money For A New World recommends." "Bernard Lietaer and Stephen Belgin compel us to rethink our assumptions about money, economics, and commerce today. Their analyses and historical insights are incisive and provoke thought about what's gone wrong with economies all over the world. But more importantly, they provide tangible solutions­illustrated in real-world examples­to challenges we face with building more just, prosperous and sustainable global societies." "Every so often, something comes along that changes our perceptions, turning our world upside-down and inside-out. 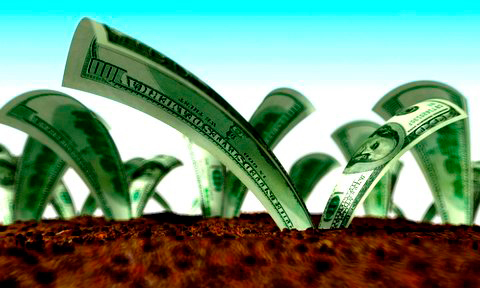 New Money For A New World will shatter the views of anyone who uses money, and show how we can make money work for us, creating greater prosperity and possibility, while bringing balance to our greatest social and environmental problems." 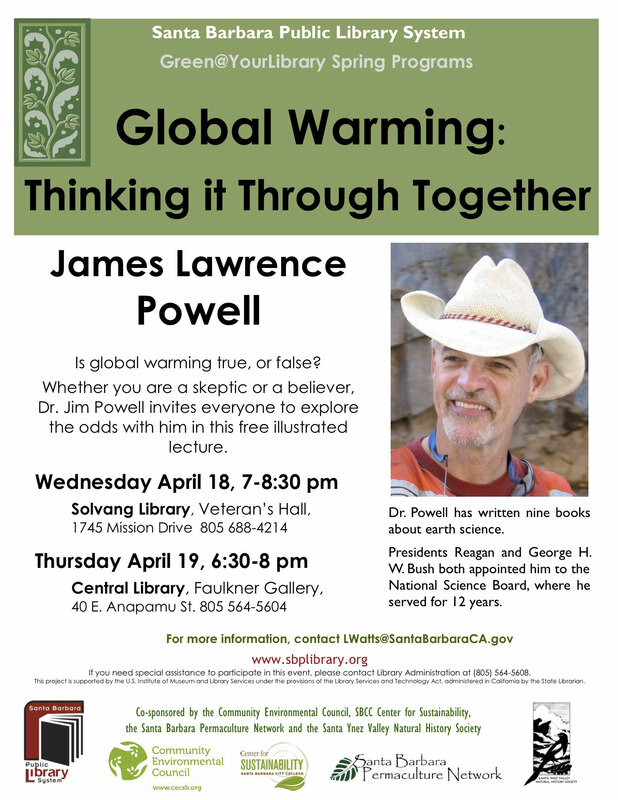 Skeptic or believer, a chance to explore the topic with Dr. James Lawrence Powell, who served on the National Science Board for 12 years. Santa Barbara Central Library, Faulkner Gallery - 40 East Anapamu Street, SB, 9310. Price: $10-$20 suggested donation - No reservations required. More info: (805)967-7369, Sharon@fairviewgardens.org. This lecture in memory of long time Fairview Garden supporter & Board Member Selma Rubin. It's no secret that our society has become unsustainable. Modern agriculture, industry and finance all extract more than they give back, and the Earth is starting to show the strain. How did we get this way, and what can we do to help our culture get back on track? 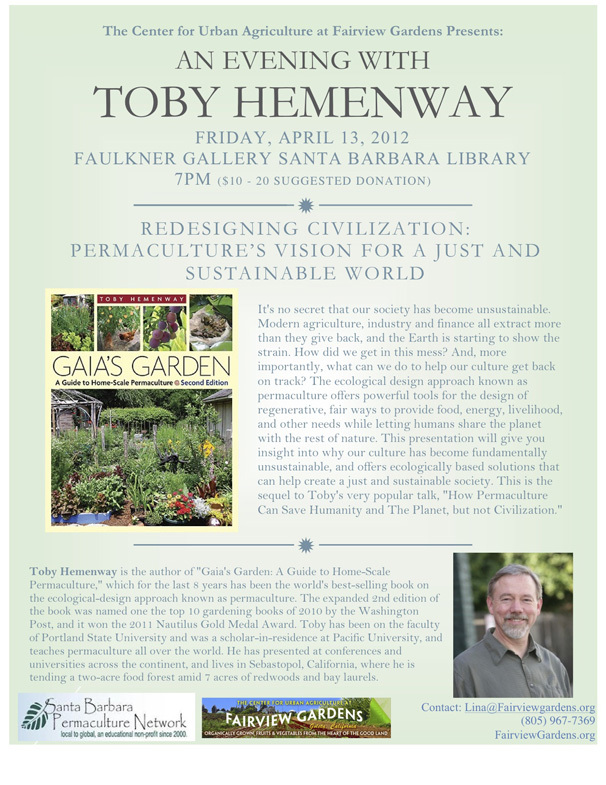 Join internationally known author, permaculture teacher, and designer Toby Hemenway, for an evening talk on Friday, April 13, 7-9:30pm, that will give insight into why our culture has become fundamentally unsustainable, and how the ecological design approach called permaculture offers powerful tools for the design of regenerative systems, with fair ways to provide food, energy, and human livelihoods, while sharing the planet with the rest of nature. Toby Hemenway is a permaculture designer and teacher who has taught permaculture courses around the globe. He is the author of Gaia's Garden: A Guide to Home-Scale Permaculture, which for the last eight years has been the worlds best selling book on the ecological-design approach known as permaculture. The expanded 2nd edition of the book was named one of the top ten gardening books of 2010 by the Washington Post, and won the 2011 Nautilus Gold Medal Award. Hemenway has been on the faculty of the Portland State University, and was a scholar-in-residence at Pacific University. He has presented at conferences and universities across the continent. Hemenway lives in Sebastopol, California, where he is tending a two-acre food forest amid seven acres of redwoods and bay laurels. Beginning in May, 2012, Toby Hemenway will be teaching a 6 weekend series permaculture design course at Fairview Gardens, an urban educational farm in the heartland of Goleta Valley. He will be joined by guest permaculture teachers throughout the course, which will focus on holistic tools for creating food, water, and energy security, building healthy communities and economies. Participants can chose to attend the entire series and earn a Permaculture design certificate or take part in specific lectures from the series. May 26-27, June 23-24, July 28-29, August 25-26, September 22-23, October 27-28. Brock Dolman, Director of Occidental Arts and Ecology Center's Water Institute http://oaec.org/brockdolmanbio; Warren Brush, Executive Director, Quail Springs Permaculture http://www.quailsprings.org; John Valenzuela, Cornucopia Food Forest Gardens; Larry Santoyo, Director of EarthFlow Design, www.earthflow.com ; and Michael Becker, award-winning educator, Hood River, Oregon. Spring CSA AND Spring AFTER SCHOOL PROGRAM! The Center for Urban Agriculture at Fairview Gardens is a California non-profit organization that was established in 1997 to preserve and operate Fairview Gardens, the historic farm where our products are grown. Founded in 1895, Fairview Gardens is considered by some to be the oldest organic farm in southern California, and is now preserved in perpetuity through an agricultural conservation easement. Fairview Gardens is situated in the midst of a growing suburban community in coastal southern California, surrounded on all sides by tract homes, shopping malls, and suburban thoroughfares. As a highly visible agricultural parcel in a dense suburban environment, Fairview Gardens plays a unique role in the community, providing its neighbors with food, educational and cultural events, open space and a connection to the land. The farm also demonstrates the economic viability of small farm operations, and the potential of small, regional farms to feed their communities. If you thought living in a city limited you to recycling plastic bottles and shopping at a local farmer's market, think again. Sustainable living­conserving an ecological balance by avoiding the depletion of natural resources­can touch every aspect of your life. It's available to everyone, no matter where you live. In cities and towns across the country, a growing number of urban dwellers are turning their homes into mini-farms complete with chickens, rabbits and goats. These urban farmers work cooperatively to create water, energy and waste-saving oases of abundance that enhance neighborhoods and communities. Homesteading in cities and towns is a pioneering effort in the creation of local economies and revitalized urban landscapes­a proactive response to some of our culture's thorniest problems. "We are at a cultural crossroads in terms of our relationship to the earth," Kaplan says. "It's clear that what we're doing isn't working anymore, and we need to find another way to live. Urban homesteading offers a series of practices that help us become stewards of the earth." Rachel Kaplan has been gardening in and around urban environments for more than 20 years and belongs to a bicoastal family of farmers and gardeners. She is a psychotherapist and educator, and offers consultation with a permaculture focus for businesses, non-profits, schools and community groups. She holds a Masters Degree in Counseling Psychology from Sonoma State University, and a second degree in Interdisciplinary Arts from San Francisco State. 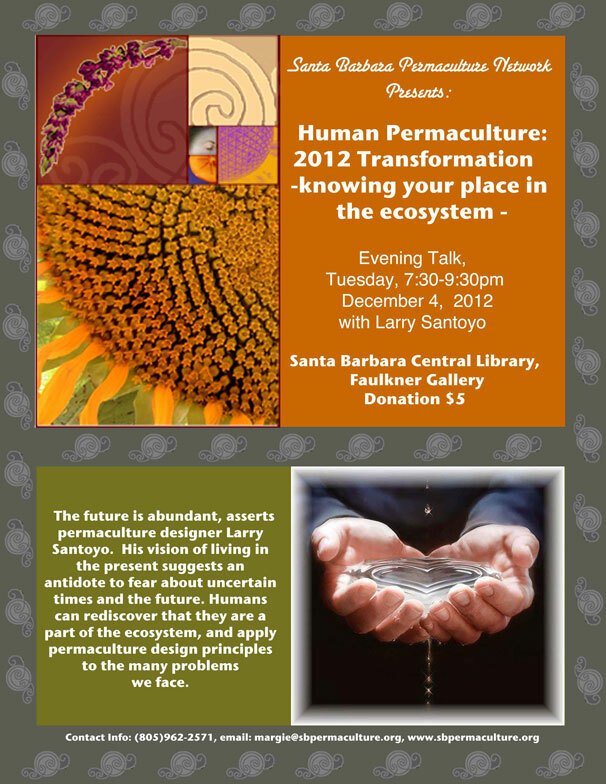 The program is sponsored by Santa Barbara Permaculture Network www.sbpermaculture.org as community service. with Special Guest Speaker, Rachel Kaplan Author of Urban Homesteading: Heirloom Skills for Sustainable Living. Price: Donation $20 - no reservations required. 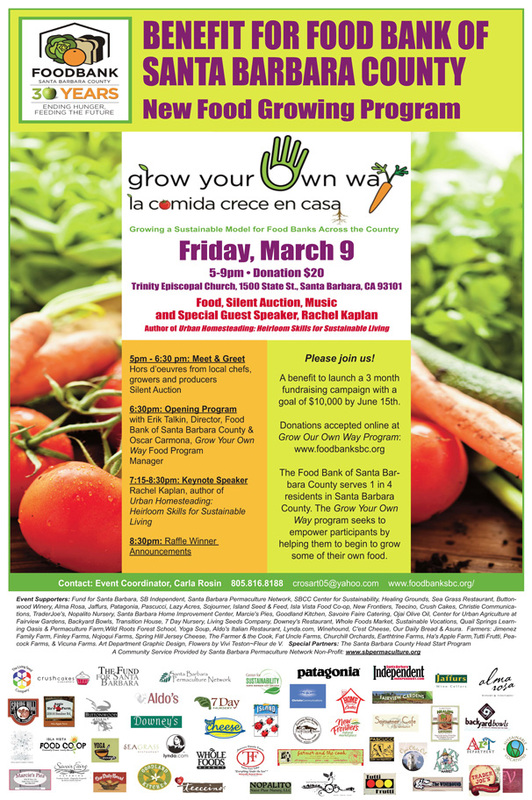 Join fellow community members for a celebratory benefit to launch the Food Bank of Santa Barbara County's new Grow Your Own Way Food Program, on March 9, 5-9pm, at Trinity Episcopal Church, in downtown Santa Barbara. What joins all parts of a strong community together is the growing and eating of fresh local food. 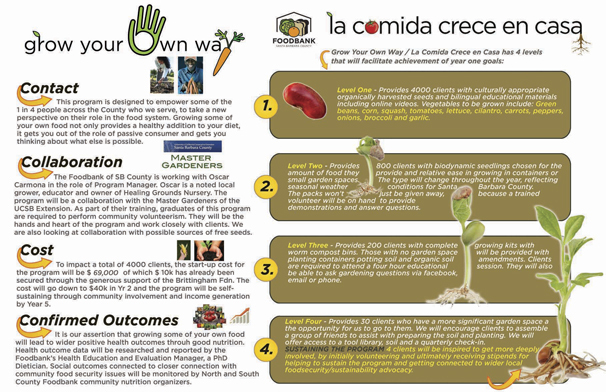 The Food Bank of Santa Barbara County's new Grow Your Own Way program seeks to empower those it serves by sharing food growing knowledge and skills. From container gardens for apartment dwellers, to developing new community garden sites, to working with local farmers to develop food growing cooperatives, the program trains food bank recipients to grow some of their own food and gain a new perspective of their role in the food system. This year the Foodbank of Santa Barbara County celebrates its 30th anniversary of ending hunger and transforming the health of Santa Barbara County. The new Grow Your Own Way Program continues with this strong intention of bringing long-term change to the nutritional health of our county. In 2011, the Foodbank served more than 102,000 unduplicated individuals from Carpinteria to Santa Maria, providing 11 million pounds of food, half of which was fresh produce. Serving 1 in 4 Santa Barbara residents, the Foodbank has been at the forefront with innovative programs such as the Backyard Bounty Program, the Brown Bag Program for seniors, the Picnic in the Park and Kid's Farmer's Market Programs for kids, and the Healthy School Pantry Program for families. The evening program includes music, unique raffle items, and regional foods prepared by local chefs Michele Molony & Rose; Kim Schiffer and Roberto Garcia. The keynote speaker will be Rachel Kaplan, author of Urban Homesteading: Heirloom Skills for Sustainable Living. Event Coordinator, Carla Rosin, 805-816-8188, crosart05@yahoo.com. The Grow Your Own Way benefit is the beginning of a three month fundraising campaign with a goal of $10,000 by June 15th. 5pm-6:30pm Meet & Greet: Hors d'oeuvres from local chefs, growers and producers; Silent Auction. 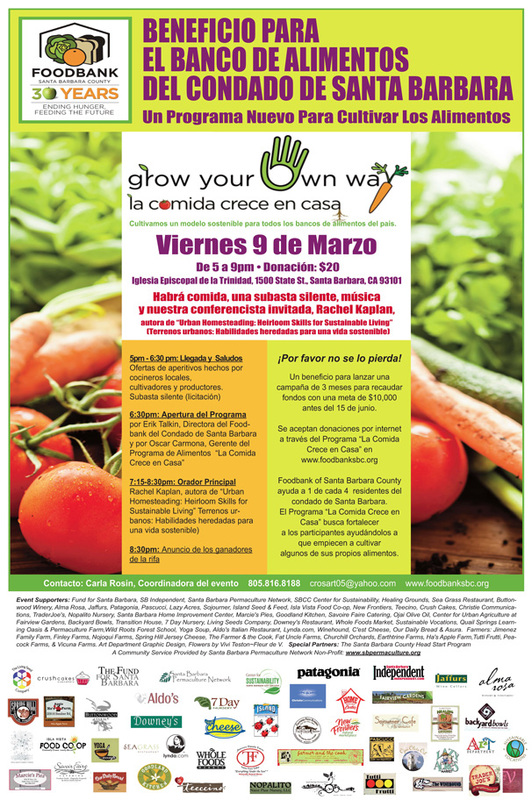 6:30pm Opening Program: with Erik Talkin, Director of the Food Bank of Santa Barbara County & Oscar Carmona, Grow Your Own Way Food Program Manager. 7:15-8:30pm Keynote Speaker: Rachel Kaplan, Author, Urban Homesteading: Heirloom Skills for Sustainable Living. Roberto Garcia of Food for Celebration; Michele Molony & Rose of Savoire Faire Catering; & Kim Schiffer of The Santa Barbara Club. Event Supporters: Fund for Santa Barbara, SB Independent, Santa Barbara Permaculture Network, SBCC Center for Sustainability, Healing Grounds, Sea Grass Restaurant, Buttonwood Winery, Alma Rosa, Jaffurs, Patagonia, Pascucci, Lazy Acres, Sojourner, Island Seed & Feed, IV Co-op, New Frontiers, Teecino, Crush Cakes, Christie Communications, TraderJoe's, Nopalito Nursery, Santa Barbara Home Improvement Center, Marcie's Pies, Goodland Kitchen, Savoire Faire Catering, Ojai Olive Oil, Center for Urban Agriculture at Fairview Gardens, Backyard Bowls, Transition House, 7 Day Nursery, Living Seeds Company, Downey's Restaurant, Whole Foods Market, Sustainable Vocations, Quail Springs Learning Oasis & Permaculture Farm & Wild Roots Forest School . Farmers: Jimenez Family Farm, Finley Farms, Nojoqui Farms, Spring Hill Jersey Cheese, The Farmer & the Cook, Fat Uncle Farms, Churchill Orchards, Earthtrine Farms, Ha's Apple Farm & Tutti Frutti. Flowers by Vivi Teston~Fleur de V. Special Partners: The Santa Barbara County Head Start Program. Gives every day people the tools they need to live more sustainably, in small and big ways. Rachel Kaplan author of Urban Homesteading: Heirloom Skills for Sustainable Living has been gardening in and around urban environments for more than 20 years, and belongs to a family of farmers and gardeners from both the East & West coasts. She is a psychotherapist and educator, and offers consultation with a permaculture focus for businesses, non-profits, schools & community groups. Kaplan has Master Degrees in both Inter-disciplinary Arts and Counseling Psychology, and is a certified permaculture designer. She lives in Northern California on her homestead Tiny Town Farm. Do you seek homegrown Sustainability that matches your values but don't live in the country? Eager to start homesteading in your urban or suburban lot? Wondering how to begin when you rent in the city? Learn about the different elements that make up an urban homestead and how to put them together in whatever space you have. Explore homestead designs that review the limitations and opportunities of both your land & lifestyle. 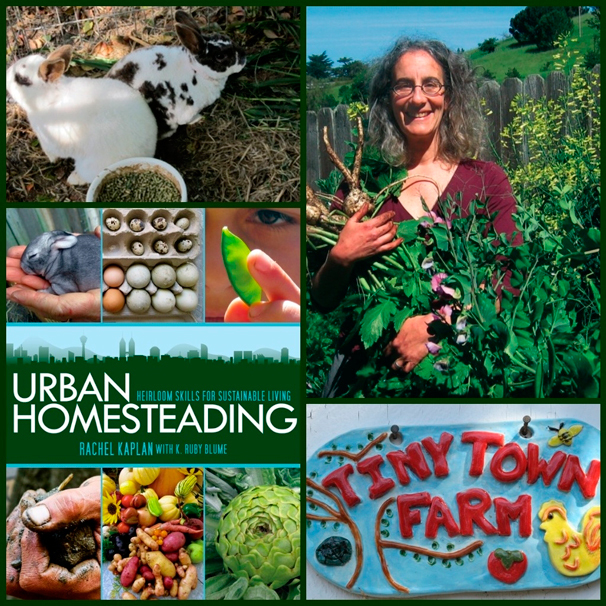 Join Rachel Kaplan, author of Urban Homesteading: Heirloom Skills for Sustainable Living, on Saturday, March 10, Noon - 4pm, at Fairview Gardens, for an exciting workshop that teaches the skills of urban homesteading with working models for affordable, abundant and beautiful ways to live. Rachel Kaplan has been gardening in and around urban environments for more than 20 years, and belongs to a family of farmers and gardeners from both the East & West coasts. She is a psychotherapist and educator, and offers consultation with a permaculture focus for businesses, non-profits, schools & community groups. Kaplan has Master Degrees in both Inter-disciplinary Arts and Counseling Psychology, and is a certified permaculture designer. She lives in Northern California on her homestead Tiny Town Farm.